Well, technically Sausilito, but it's like 20 minutes from my apartment across the stunning Golden Gate Bridge, so it barely counts. My friend Niki texted me and said "Hey, do you want to go Stand Up Paddle Boarding, tomorrow?" And I was like, "Um, YES!" 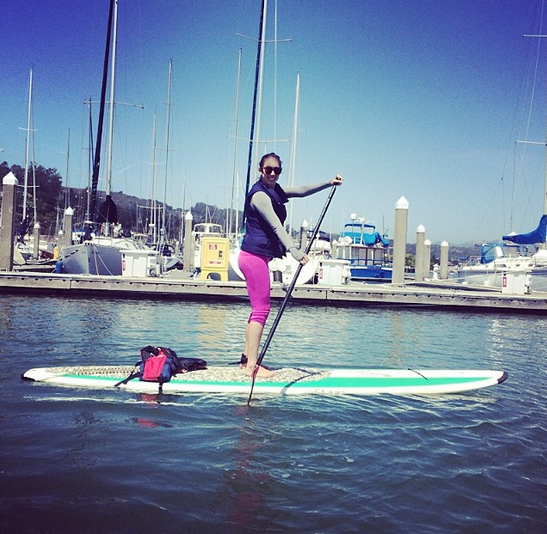 I have always wanted to try this, I love being out on the bay for any reason and I had heard it was an amazing workout. So we put on our many layers of yoga clothes (with bay area weather, you never know - could be bikini weather, could be freezing, could be both in a two-hour span) and with our to-go cusp of almond-milk iced coffee in hand, headed to the beach. And of course, because I have the worst weather luck it was super windy. I could barely stand up and my tall, lanky body was acting like a giant sail pushing me the opposite of where I wanted to be. I almost got hit by a sailboat! It was an amazing, fun, playful workout that totally killed my arms, shoulders, core and legs. Basically it was heaven and I can't wait to go back!